by David Klinghoffer – Hardcover, 256 pgs. Is morality based on some essential truth or is it defined by society? In this highly original critique of American social mores and popular culture, David Klinghoffer argues that the Ten Commandments are essential to maintaining a morally healthy society. With the meticulousness of a scholar, he begins by excavating the meaning of the Commandments. Drawing on the millennia-old rabbinical work Mechilta, he explains that the Decalogue was written on two tablets to show that when a country neglects the Commandments written on the first tablet?those having to do with the relationship between God and peoplethe interpersonal relationships described on the second tablet suffer irreparable damage as well. By shrugging off the Bible as a guide and turning toward secularism, America has created a crude, cruel, and dishonest national life. Addressing such timely topics as the controversy over public displays of the Commandments and the battles over Intelligent Design, Klinghoffer demonstrates that Christians and Jews are united in their opposition to the pagan aspects of our culture. In the tradition of Hebrew prophets like Jeremiah and Isaiah, he describes our failings with humor and compassion, but also with anger and disappointment. 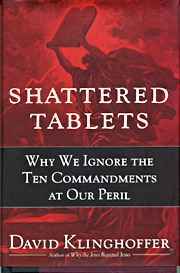 An unusual, incisive perspective on the role of religion in society, SHATTERED TABLETS is sure to spark debate. In the end Klinghoffer arges that by shrugging off the Bible as a guide and turning toward secularism, America has created a crude, cruel, and dishonest national life.